Of course we still can watch all the pictures, and in fact the French version is a bit different than the English one in this respect. With this blog post I will tell you about some striking differences. The book is very handy for this reason but still big enough for comfortable reading. Next, the layout ( number and position of the pictures in the different chapters) is completely different. The English version has much more pictures, I did not count them all but I feel it has something like 50-100% more pictures. The French version however is from 1985 (the English one from 1984) and includes a few pictures from the Brothers in Arms period. 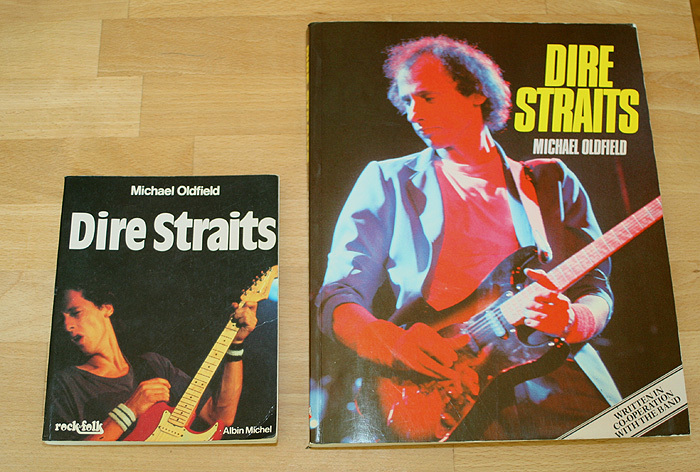 In fact the last chapter is about how Dire Straits’ career continued after 1983, such a chapter is not included in the original English version. 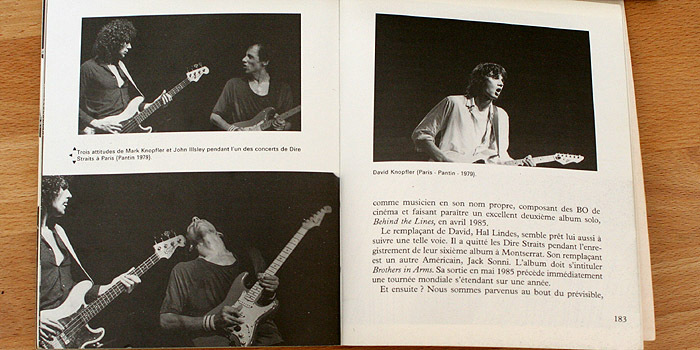 The French version has five pictures of a gig in Paris in 1979 which are not included in the English version. 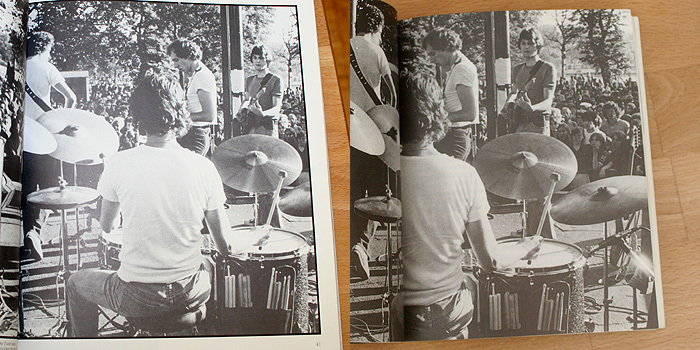 Many pictures have apparently being cropped, both in the French and the English version, which means that you see a bigger part of some pictures in the English version, while other pictures were cropped less in the French version. 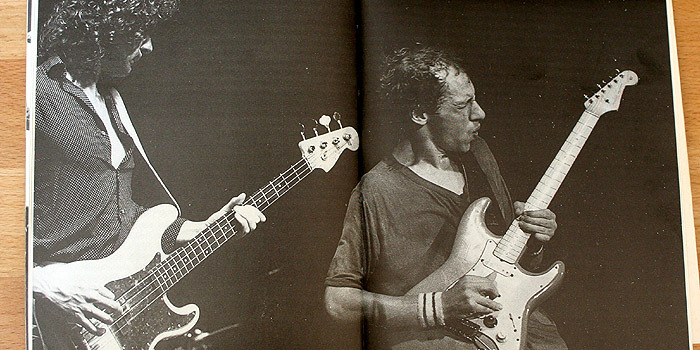 We already came across this when Jean-Francois told us in a comment that in his French edition you could see a Strat in its guitar stand at the edge of an early Dire Straits picture (one from the Clapham Common gig in 1977) which you can’t see in the English book. 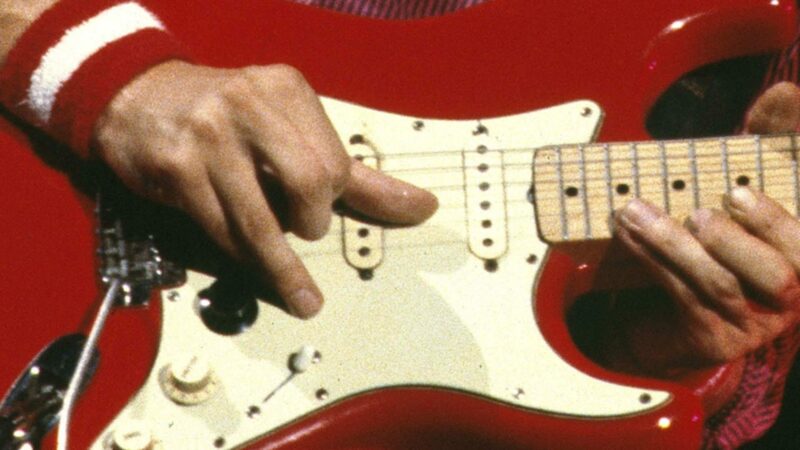 Unfortunately none of the pictures revealed any new hints to any gear like guitar floor effects you have never seen on any picture before. So all in all, if you are another mad DS/MK fan, with these differences it should be easy to convince your wife that you really need to spend a bit of money for a book in alanguage you don’t understand, on the other hand, if you have the English version – which I recommend as a really great book – you are not missing too much. I have the same edition (small), and I’ve never seen another french one. 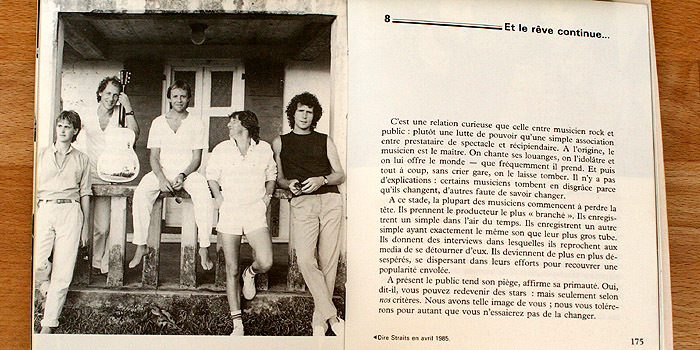 There’s also another french book (again with a pic of Mark during OES tour on the cover): a small one, I think smaller than the Oldfield one. My friend drummer has it, but I’ve never read it. to my knowledgae, these are the only 3 books about DS in french. The one I saw was the one by Oldfield and had the same cover photo, I am about 85% sure it was bigger.